The year 1945 in Czechoslovakia was a time of euphoria from the end of World War II. And yet it was also a time of “national cleansing” – in which traitors and collaborators were harshly punished. Anyone the nation linked (justifiably or not) with Nazi Germany. The basic principles of justice and judiciousness were replaced with a passion for vengeance, explosions of rage were an everyday event. Some were executed by lynch mobs in the streets, while others were called before extraordinary people’s courts. The maximum duration of such trials was three days, and only the chair of the tribunal was a professional judge. The remaining four were so-called jurors from among the people, who could easily outvote the chair of the tribunal. A sentence of death required no more than two unsubstantiated testimonies. Executions were performed within two hours of the passing of the sentence, at the explicit wish of the condemned this timeframe could be extended to three hours. Almost 95% of these sentences were carried out, making Czech retribution in this respect the bloodiest in Europe. Executions often became folk spectacles, the progress of the executions were documented, and the photos obtained were even sold as postcards. The British historian Keith Lowe refers to post-WWII Europe as a “wild continent” in which law and order were practically nonexistent, as were morality and shame. Hatred was fomented even against certain film stars associated with the Nazis. The most famous of them were the actresses Lída Baarová and Adina Mandlová. Whereas the relationship between Mandlová and K.H. Frank (practically the most powerful man in the Protectorate of Bohemia and Moravia) was merely a rumor, Baarová truly did have a love affair with Joseph Goebbels (one of the highest ranking men in Nazi Germany). While neither of them could be proven to have contributed to any arrests or manhunts during the war, quite the contrary, the postwar conventional wisdom of the street was categorical. Both found themselves in prison. Similarly, 1945 also witnessed the arrest of Hana Krupková, a girl who helped the Silver A group, the people who organized the assassination of the Reich Protector Reinhard Heydrich. 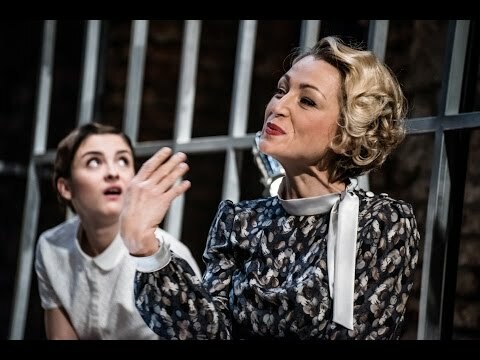 The play Pankrác ‘45 takes place in these very revolutionary days, where a single cell in Prague’s Pankrác prison sets the scene for a meeting not only of Adina Mandlová, Lída Baarová, and Hana Krupková, but also the Jewish Julča and a fifth woman whose identity is revealed only during the course of the plot. They don't know how long they’ll be there. They don't know whether they will ever see the outside world alive. They don’t know whether their meeting is entirely coincidental. They don't know who is truly guilty, or their crime. Each of them responds to the situation differently, and differently seeks to navigate it. The Jewish Julča and Hana Krupková have experienced the concentration camps and know the need to remain calm and save their energy. The unknown woman doesn’t speak at all. Meanwhile the actresses always remain actresses, determined to compete for the attention of their albeit small audience, even behind bars. Their main task is to survive – a task which each envisions differently. A play about the relativity of guilt, about the blindness of vengeance, about responsibility for one’s actions, about remembering. About the struggle to survive within the machinery of history. The meeting of these five women itself is fictional; and yet they encountered each other in the Pankrác Prison individually, or could have. The period context and themes from their lives adhere to historically proven facts and a renowned historian contributed to the writing of the play. The play by Martina Kinská was based on real life events. Thanks WD LUX for providing material for producing the scene.